It’s funny the things you forget over the years. When Frank and Dan from R&R Games asked me to write a designers diary for ROME: CITY OF MARBLE, I was a little terrified. Though I blog occasionally here, I’m not very comfortable with long form writing: you won’t find many posts longer than a handful of paragraphs, and most of my writing clocks in at 140 characters or less. 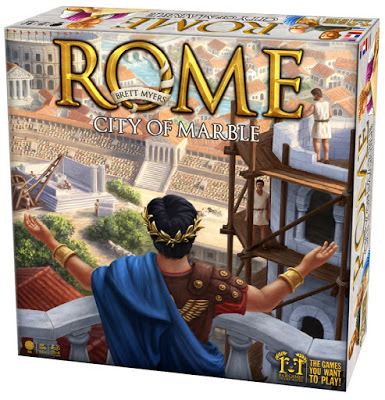 To make it more difficult, ROME: CITY OF MARBLE has been in development for over eight years. I can’t always remember what I did last weekend, let alone the early stages of design on an eight year old game. To jog my memory, I dug out an early design notebook and scoured my gmail archives for inspiration. I found a few things that brought a smile to my face. Here are some of the bits I found interesting and meaningful. I hope you find some inspiration in them, as well. ROME: CITY OF MARBLE (from here on, I’ll refer to it as R:CoM) was conceived about eight years ago in one of those serendipitous circumstances, where a quirky mechanism meets an unattached theme and there’s a sudden, undeniable spark (maybe I should refer to it as Rom:CoM). When I got the first ideas that eventualy became R:CoM, I was working second shift at my “day” job, which afforded me long stretches of inactivity I could fill by working on game designs. I was exploring ideas for a set-collection game with optimal sizes for the sets, where there was not only a point of diminishing returns, but if a set exceeded a certain size, it lost value. I envisioned a spatial aspect to it, an exploration or area control mechanism that would allow players to delineate the sets within a bounded space. Enter game designer and fellow Protospiel alum, Andrew Juell. In addition to being a brilliant designer and mathematical genius, Andy was a fellow night owl and we spent many nights talking game design esoterica over IM. I mentioned my trouble with this nut and he cracked it with the simple suggestion of using rhombus tiles. A 60-120 rhombus will tile the plane and create vertices of 3, 4, 5 or 6 points. Crucially, you can’t know the ultimate size of any vertex until it is actually completed, meaning I could incorporate the brinksmanship, direct competition and risk assessment I longed for. 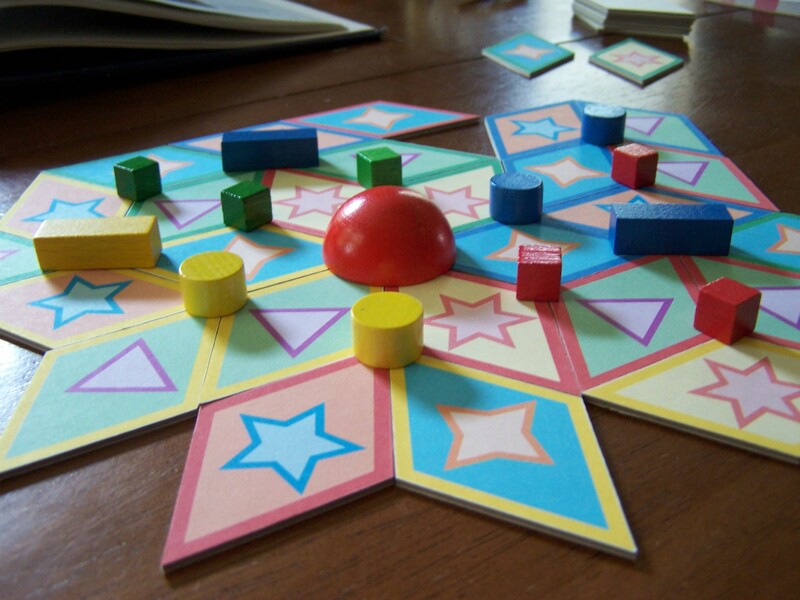 With a bit of juggling, rhombuses became the central element of R:CoM, providing players with both direct control and an essential element of uncertainty and risk. I now had the beginnings of a core mechanism but I was lacking a theme. One of the first themes I remember looking at was of Inuit hunters staking out territories in the Arctic with inuksuit, stone formations used as guide posts and messaging centers. I love that theme, but it was soon to appear in my first published game NANUK, designed with my good friend Mark Goadrich, so I iced that idea. Paging through my design notebook led to a few surprises: I’d completely forgotten about some of these other theme ideas. Central Park? I must have recently watched the PBS documentary series Frederick Law Olmsted: Designing America. 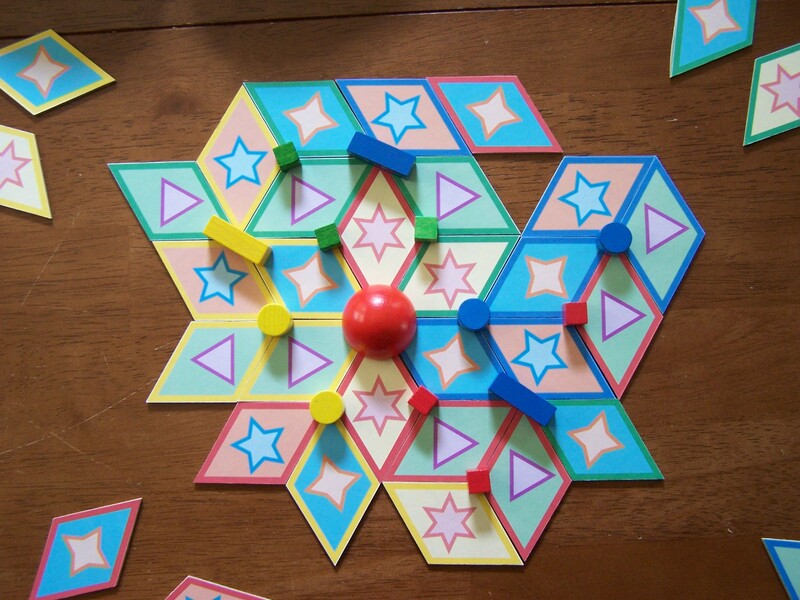 In this version, players developed their own boards rather than competing on a central board, which doesn’t really make good use of the rhombus tiles. I scrapped that theme, but I still think the historical competition to design New York’s Central Park would make a brilliant game. Kootznoowoo: The Fortress of the Bears is an awesome name, but the theme didn’t quite fit with this mechanism. Kootznoowoo is the native Tlingít people’s name for Alaska’s Admiralty Island, home to about 1800 brown bears (and subject of yet another PBS documentary – sensing a theme? ), and the idea of Pacific Northwest Coast indigenous peoples-inspired bear tribes exploring and competing for territory was pretty tempting, but just I couldn’t imagine a publisher willing to put out a game named KOOTZNOOWOO: THE FORTRESS OF THE BEARS. Someday, perhaps. Someday. 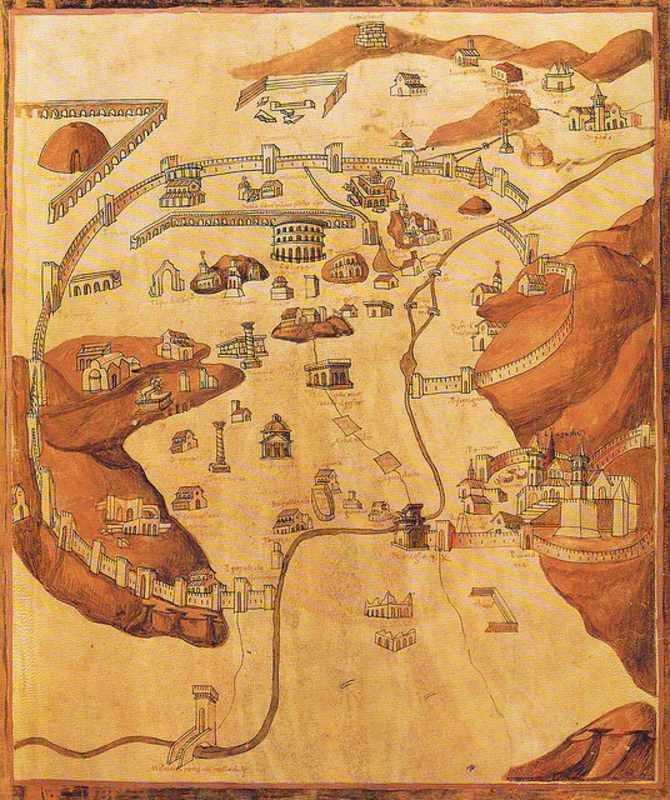 It was a medieval pilgrim’s map of Rome, something like the one above, that gave me the perfect theme. Like a medieval version of one of those Chamber of Commerce illustrated maps that shows all the pertinent businesses in your home town, this map was mostly devoid of street level detail, but was dotted with all the important monuments, grand architecture, churches and sights any medieval traveler would wish to see. As I played around with the tiles and blocks in my earliest prototype, I could almost see all of those grand works dotting the sprawl of Ancient Rome. Around this time I had several conversations with my friend and neighbor Michael Carlson, a passionate advocate of good architecture and public spaces, about the organic way neighborhoods and cities grow. The ideas and concepts we talked about inspired me as I developed mechanisms to support and reinforce my new theme. We talked about Christopher Alexander’s notions of urban design in A Pattern Language: Towns, Buildings, Construction, and the idea of the “placeness” of neighborhoods–that quality of being a distinct place within the greater context of the city. Michael showed me a plate in Allan B. Jacobs’ Great Streets, a “testament to the street as the foundation and basis of culture, economics and social energy.” as one Goodreads reviewer puts it. 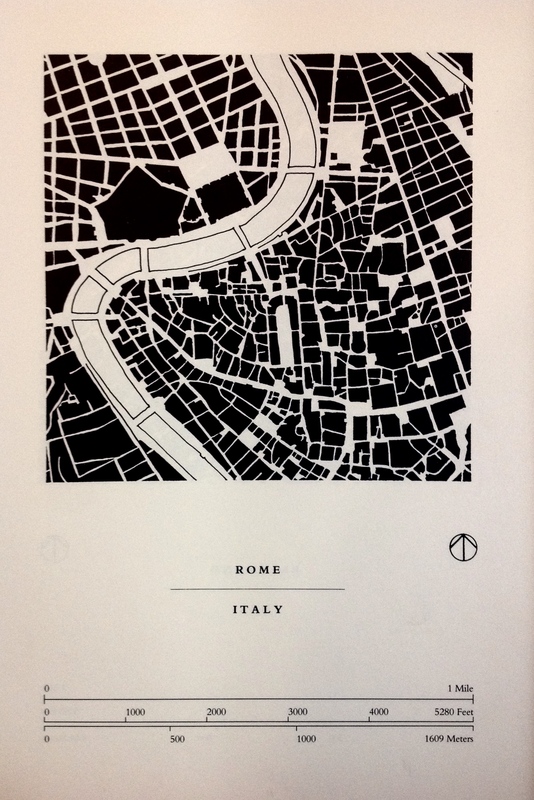 I could see, in the patterns formed by the streets in the oldest sections of Rome, a chaotic-seeming organization of necessary connections that held within their lines the story of a growing metropolis. I would emulate that street pattern on the neighborhood tiles in all my future prototypes of R:CoM. 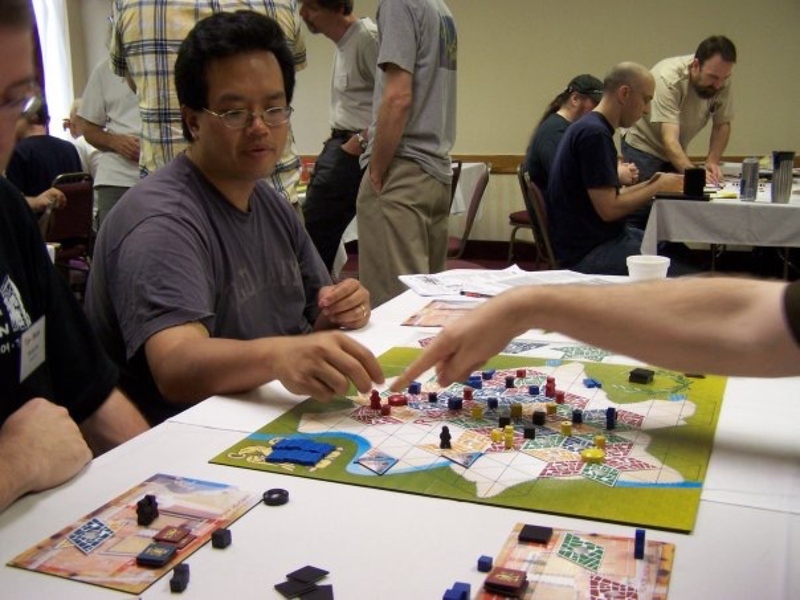 After developing the game with the Roman city-building theme for about a year, I brought it to play test at Protospiel in the summer of 2009. This was its second year on the table at Protospiel and the difference was notable. One of the publishers in attendance liked it enough to ask for some specific changes, and to see it again at GenCon the following month. I made the desired changes and showed the game at GenCon and sent the prototype home with a handshake agreement. I continued to play test and develop the game at home, working with the publisher over the following months until we were both happy with the game. Four years passed. I continued to design games and improve my craft. By April 2013 it had been more than a year since I’d heard from the publisher who had R:CoM (I was calling it RHOME then: Rhombus + Rome = Rhome), so I decided to make a brand new prototype and show it at The Gathering of Friends. I was able to show it to several major European publishers that week. All enjoyed playing it and each gave useful and constructive feedback I would soon use to improve the game. One flaw I had been struggling with from the beginning was resolved by a suggestion by designer Brad Fuller, who sat in on one of the publisher play test meetings. His simple suggestion to put marks on the corners of each neighborhood tile revolutionized how vertices were addressed that (eventually) led to cascading improvements in game play. By June of 2013, I had perfected R:CoM. I made another new prototype and brought it to the Roundhouse Retreat, a private, yearly, game design retreat hosted by my good friend James Kyle, who I met at Protospiel many years ago [Protospiel!]. There I played it with brilliant designers and brutal play testers Dave Chalker and Kory Heath. Over the next two days we tore it down to its basest elements and tried any number of ways to satisfactorily reassemble it. We failed, repeatedly. I was devastated. I took it home and sulked for a whole month. I stewed. I couldn’t work on anything. 1: RHOME was designed many years ago by an inexperienced game designer. 2: Kory and Dave are minimalist designers and would never be satisfied with my vision for an intricately designed, big box board game about building Ancient Rome. 3: Most importantly, I now had a decade of game design experience under my belt with the skill to make R:CoM a thing of beauty. I would take Kory’s and Dave’s suggestions to heart and use them to design the game I wanted to design. I spent the next nine months heavily re-developing R:CoM, finding loose connections to tighten, trimming fat, polishing facets, rounding corners and making it the best balanced, thematically integrated, intentionally designed game I could make. I brought it back to The Gathering in 2014 to play test and show. I was nervous about how it would be received, this game I’d just poured all my heart and effort into. Naturally, I forgot a rule when teaching it the first time. It turns out it played better without it, so I got rid of it. Frank DiLorenzo from R&R Games was the first publisher I showed it to. Frank was immediately drawn in and before the game was half over, he told me he wanted to publish it. He loved it. Then he beat me at my own game. I couldn’t have been more pleased. 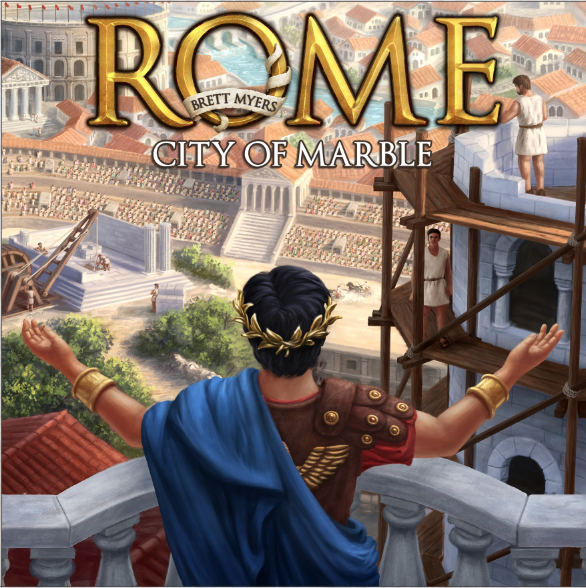 BoardGameGeekTV has released their preview video of ROME: CITY OF MARBLE from Spiel 2015. It should be hitting FLGS shelves in the states in a week or two!